This year’s Wege Speaker Series is the 19th annual environmental lecture event, beginning April 23 at Aquinas Performing Arts Center. In this episode of Catalyst Radio we feature an interview with the keynote speaker of the upcoming annual Wege environmental lecture series, Edward Mazria. Mazria is the founder of Architecture 2030 – a nonprofit research organization with a stated goal to “transform the building environment from being a major contributor of greannhouse gas emission, to being a central part of the solution to the climate and energy crises." Every spring since 1997, the Wege Foundation has invited scientists, authors and thinkers to present a free public lecture on environmental issues and their connection to healthy economies and communities -- a connection referred to by Peter M. Wege as "Economicology." This is the first speaker series since the passing of Wege Foundation founder Peter Wege in 2014. Some previous have been Robert F. Kennedy, Jr., Chief Prosecuting Attorney, Riverkeeper; Tom Kiernan, CEO, American Wind Energy Association; and Dr. Marie Lynn Miranda, Dean University of Michigan School of Natural Resources and Environment. 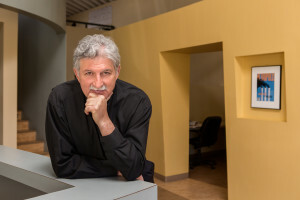 We talk with Wege series keynote speaker Edward Mazria, via telephone.